It is possible to capture an image from the camera and upload this via a file input tag. All you need to do is create your webform and include an input with the type "file". Please note the "accept=" filter is currently not supported. 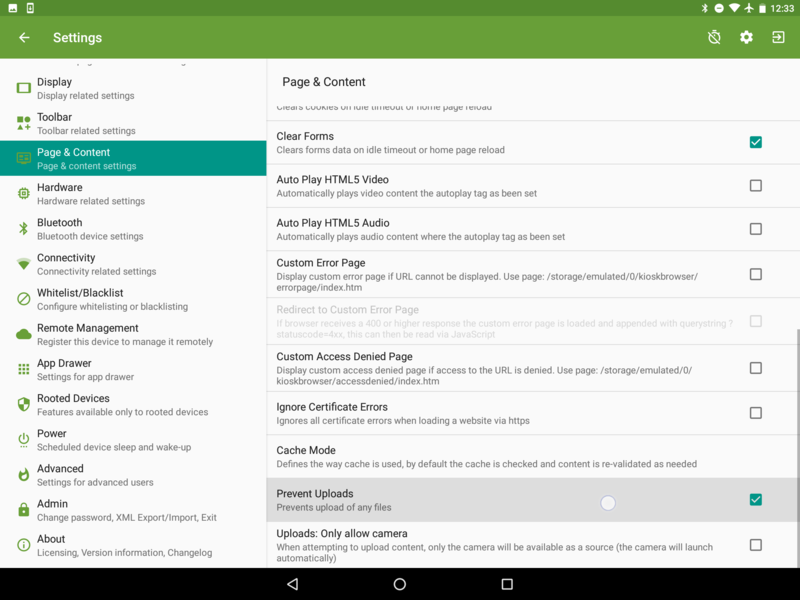 Please note that Google removed a private API from Android 4.4 and therefore file uploads do not work on 4.4. You must be running Android 4.1, 4.2, 4.3, 5.0 or higher for this feature to work. As of Version 2.6.0 (Build 193) released on 12/07/2017 (Android 5.0 >) we have added a setting to only allow uploads from the camera regardless of whether the input tag specifies the capture attribute. Useful if for example you are uploading to a third party website that allows uploads of any type. This can be found under Settings > Page & Content > Uploads: Only allow camera, or if you&apos;re a Remote Management user it should be changed in your device profiles. Enabling this option will prevent any other sources such as documents or images from other applications, from being displayed when a click event to upload takes place, and will immediately launch the device camera. By enabling the option under Settings > Page & Content > Prevent Uploads, you can also prevent users from uploading any content. Enabling the "Uploads: Only allow camera" setting, will override any capture attributes set on the website, and will force the camera as the only upload medium. If the capture attribute is not set on the website, and the "Uploads: Only allow camera" setting is not enabled, then this will open the menu allowing users to select camera/documents to upload.